You know the scene in “The Grinch Who Stole Christmas” where his heart grows three sizes? That’s how backbends can feel. With the back long and the arms reaching back, the chest can open and give plenty of space for the heart to grow and expand. This growth and expansion is a a great energy boost and can instantly transform a grinchy mood into a festive holiday mood. 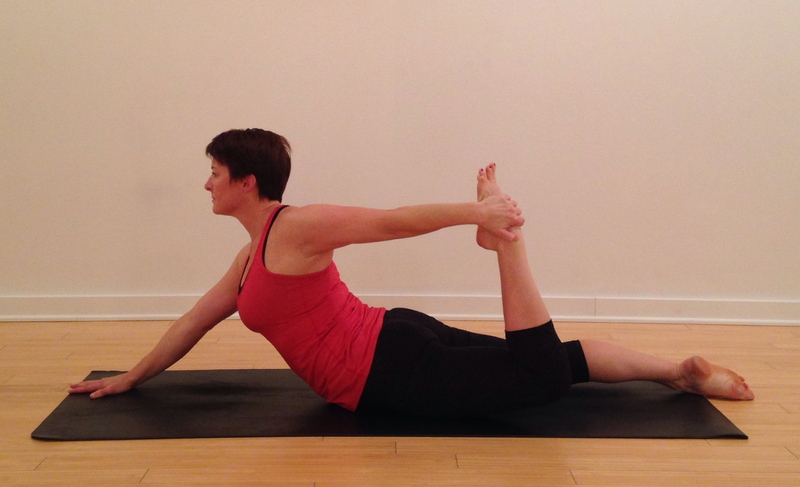 Ardha Dhanurasana or Half Bow Pose is a backbend that can be accessible to a lot of yogis. This posture can be done on the belly, or for more challenge from a standing posture. In half bow, one leg grounds and creates a foundation while the other bends to form the backbend. A hand reaches back to provide tension or traction with the foot. 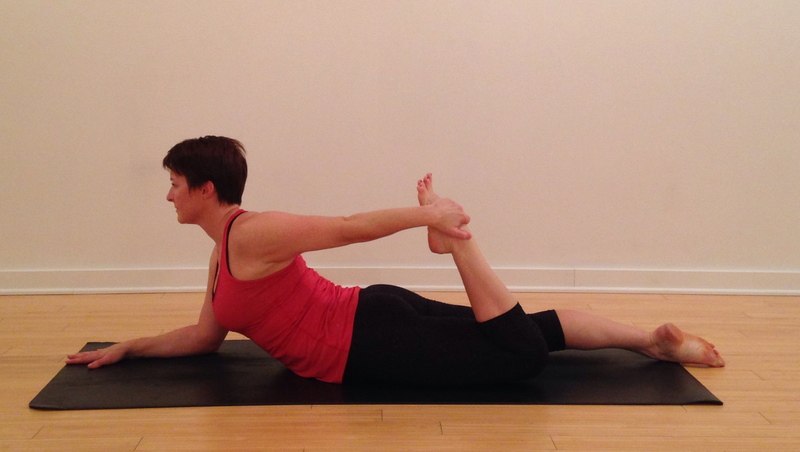 The spine lengthens first, then curves into the backbend, opening the heart. To ensure safe and enjoyable backbends be sure to warm up the quads, shoulders, chest, and back before practicing them. If you feel any “crunching” or discomfort in the back, especially the low back, be sure to try easier modifications. Focus on creating length in the spine and separation of the vertebrae to bring ease into the posture. Opening the hip flexors and reaching the tailbone toward the heels are actions that can help maintain space in the lower back. Try these variations to build up to your fullest expression Ardha Dhanurasana or Half Bow Pose. Option 1 – Ardha Dhanurasana Prep. Start in Sphynx posture with the forearms at shoulder width. Ground the base foot to the ground. Spread the toes and press the tops of the feet and toenails into the floor, make the leg active lifting the kneecap toward the hip. Reach the tailbone toward the heels as you pull the heart forward. Soften the shoulders down the back. Bend the opposite leg, keeping the knee and foot in line with the hip. Reach back with the same hand for the foot. Think about softening the hamstring as you open the chest to reach. A strap can help bridge the gap, but the reach without one can be effective also. Option 2 – Ardha Dhanurasana Making Contact. 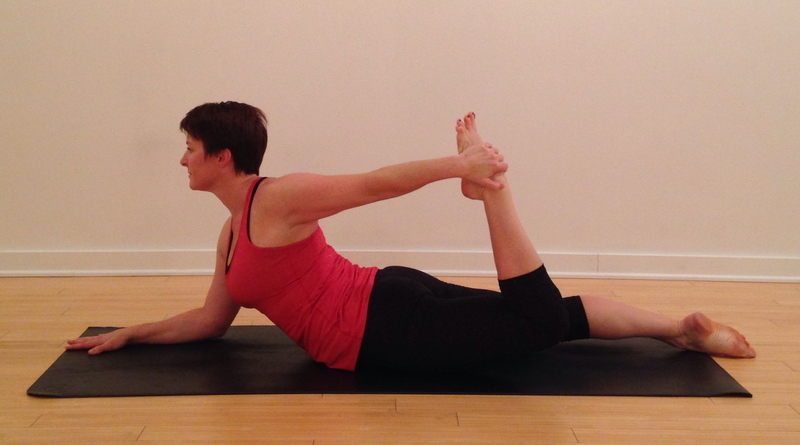 When you can reach the foot, realign the shoulders and hips to square towards the front. Resist the temptation to fight and “muscle” the grab. Take time to create softness and peace in this posture before moving on to the next stage. Both legs are still actively working, the grounding foot is still pressing, the bent leg is lengthening through the quad. Take notice of the low back and neck. Both should be free of strain and discomfort. Option 3 – Ardha Dhanurasana Kicking Away. After making contact with the foot and ensuring the back is optimally long, kick the foot away, keeping the hips grounded. Continue to reach the tailbone toward the heels. With the hand, gently pull, resisting the kick and use the leverage to lift the heart. Bring attention to the neck and jaw, both should be soft and gentle. Try not to clench the teeth or tighten through the face. Play with the position of the hand. Try reaching for the outside of the foot with the thumb down (as pictured) and try reaching for the inside of the foot with the thumb up. These varying positions offer different opportunities to open the shoulder. Option 4 – Ardha Dhanurasana Additional Variations. If the back and the quads feel like there is more room for expansion, press into the base arm, keeping the shoulders squared. With the base arm long, pull the shoulders away from the ears, keeping them integrated on the back. This action will deepen the backbend. For another option, reach for the back foot with both hands. With the thumbs pointing down, interlace the fingers around the foot. When the grasp is set, kick away and lift the heart for full expansion. If you are trying this posture from standing, be sure to keep the hips as square as possible. You can image that your belly button is still grounded to the floor. The standing leg now becomes the base, pressing into the ground, creating a solid foundation for the balance. You can use a block for support as you get into the standing variation. So how many sizes can your heart grow this holiday season? Practicing backbends will give plenty of space for you to break the Grinch’s record. Be sure to work where you feel challenged, but also where you can breath and relax around the work. Follow this weekly challenge @suzannewrightyoga on Instagram or at Suzanne Wright Yoga on Facebook. If you post your pictures or share about your experience be sure to tag #PowerPose and @suzannewrightyoga.